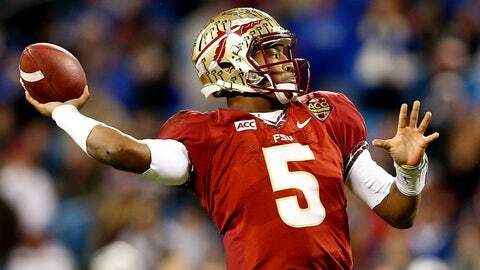 Heisman Trophy winner Jameis Winston and the Seminoles are seeking the ACC's first national title since 1999. It seems somehow fitting that as the BCS era comes to a close, the team that has been the ACC’s most dominant program will bookend it. Since Florida State joined the ACC in 1992, it has won the league’s only two national championships in the last 30 years and essentially run roughshod over the rest of the league in the process. The Seminoles gave the ACC credibility. While the SEC has had four different programs win the BCS national title and several more be competitive, it wasn’t the overall competitiveness of the league or its depth that people pointed to prove its dominance (though that didn’t hurt). Instead, it was those seven national titles in seven years. From the 2006-07 season until present day, the SEC has reigned supreme over the rest of college football. And it already had two BCS titles previous to this run, so that’s nine of the 15 championships from 1998-on. Florida State played in the first three BCS national title games and won one of them (in 1999), the ACC’s only national title in the BCS era. When Florida State started to slip a bit as a program, so, too, did the ACC. The Seminoles’ reputation has always been directly tied to that of the ACC. Even the addition of Miami, Virginia Tech and Boston College in 2004 didn’t help change that. The Hurricanes were coming off of a stretch of two national title games in the previous three seasons, but since joining the league, they’ve played in exactly zero BCS games. Virginia Tech is 1-4 in its five BCS appearances since expansion, which leads the league, and FSU is 1-1. And so since expansion, the ACC is 2-8 in BCS games (it was 1-5 before). Florida State has eight BCS appearances, counting this year, and is 2-5 in those games. On its own, FSU is responsible for two thirds of the ACC’s BCS game wins in the BCS era. The ACC’s 3-13 record in BCS games is by far the worst record of the major conferences, and even with two more wins this year — if that happens — the ACC would still have three fewer wins than the next-closest major conference (the now-defunct Big East, which finished 8-7). If anything, it seems expansion just made the ACC look worse rather than better. No one seemed to mind as much when it was Florida State running things. Mostly because Florida State at its peak was unquestionably dominant, as the Seminoles are this year. Last year’s round of expansion added Pittsburgh and Syracuse to the mix, and while both teams are fairly mediocre, both did end up making bowl games this season. Along with nine other ACC teams, giving the league a record 11 teams in bowl games this year. No other conference has ever had more. Three of those teams are 6-6 and three more are 7-5, but bowl games are bowl games. The league will certainly take it. In spite of the league’s overall depth, as the season wound down and the ACC slipped a bit further into mediocrity, there started to be some rumbling about whether or not Florida State has played anyone and if the ACC was actually any good. FSU didn’t have a marquee non-conference win, but the Seminoles absolutely crushed everyone in their path. Including a then-third-ranked Clemson team that was playing as well as any team in the country entering the October matchup on the road, and a talented Miami team — which was ranked No. 7 — that arguably played its best game of the season and still lost by 27 points. Now, the ACC is looking at being the underdog in all but two bowl games this year (the Belk Bowl, where North Carolina is favored over Cincinnati, and the national title game, where FSU is favored over Auburn). So if the ACC loses every game except for the national title game — which is certainly a possibility, according to Las Vegas — will it matter? In terms of the conferences’ winning percentage overall in bowls, perception certainly doesn’t reflect reality. The SEC has led in that category just twice in the last nine seasons, but winning the national title seven times in that span certainly hasn’t hurt. And the SEC has gotten more teams into bowls than a lot of other conferences, leading the nation in bowl teams six of the last seven seasons (and ranking second in the only season it didn’t). But tell the Big East how much overall bowl winning percentage matters — that league finished above .500 in bowl games every year since 2006 and was still looked at as perhaps the only major conference worse than the ACC every year. The SEC has finished below .500 collectively as a league in bowl games just once since 2004. The ACC, by comparison, has finished at .500 or above in bowls four times in the last nine years and just once since 2006 (last year). The last time a league had just one bowl win overall was 2008 and it was the Big Ten. The conference was 1-6 in bowls and 0-2 in BCS bowls. But it still got two teams into BCS bowls two of the last four seasons and went 3-3 overall in those games (13-19 overall in bowl games). Ultimately, all that matters is who is winning the national championship. Maybe in the years to come, if some of the ACC programs under new leadership continue to flourish and grow — and if next year’s new addition Louisville continues on the path it has been on under Charlie Strong — this year will be looked at as proof of the ACC’s depth rather than proof of its mediocrity. But if the ACC drops out of the national title/playoff conversation early in the coming seasons and stays out of it, as it has in past years, it won’t matter how deep the league is or how many bowl games it wins. It only needs to win one. It will raise a few eyebrows nationally, of course, if the ACC goes winless in all other bowls except the national title game. But if it goes winless except for a national title win (against the SEC Champ, no less), the league will certainly take it.